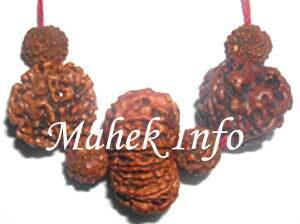 Eight Mukhi Rudraksha is ascribed to Lord Ganesha. Its deity is Batuk Bhairav. 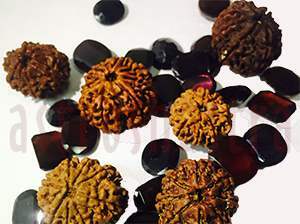 It is considered very auspicious and bestows all comforts, success in ail under takings (Riddhi-Siddhi) and removes all obstacles. This removes sins arising out of illicit relations with women. 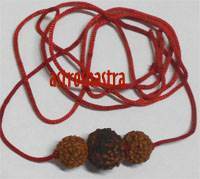 This Rudraksh should be worn on a Monday morning after rituals in gold/silver chain or in a black thread. Presence of benefic Rahu in horoscope gives benefit in speculation business and helps in getting sudden wealth. Wearing this beads helps in increasing your chances to win in Luck games. 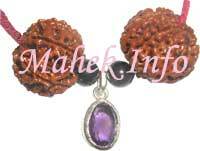 It is one of the most auspicious bead available. 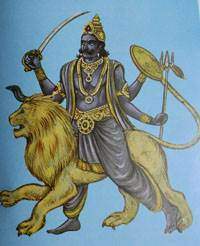 Its ruling planet is Rahu hence helpful in sublimating it's malefic effects. It increases the strength of character and mind and help achieve happiness, fame, good health and increase confidence. 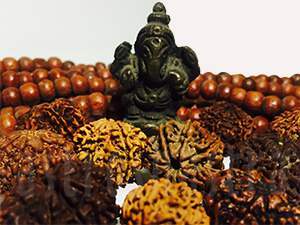 Lord Ganesha, elephant headed benign god, the son of lord Shiva and Parvati has special grace on the wearer of this Rudraksh . By wearing it on one's person all the pleasures increase and all the difficulties diminish. This is especially USED IN WORSHIP AND RITUALS. 2. It improve mental concentration. 3. Appease planet Rahu and its malefic effect. 4. It saves the wearer from accidents. 5. Ghosts and pishach can never do harm to its wearer. 6. Cancels the sins arising out of illict relations. 7. Protect children from diverting their minds to illegal and irrelevant things. 8. It is helpful in betting and winning lotteries etc. 9. 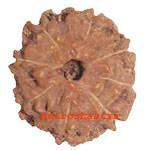 Eight mukhi is helpful in controlling the diseases of Lungs. Rahu and ketu show the play of "Raga-Dwesha", the attraction and repulsion that take place constantly in the mind on a sub - conscious level. They ae the factors that create the mental agitation and lack of mental peace. Rahu's affliction can be related with sub-conscious turmoil coming from unresolved situations from previous lives. It indicates a need to understand the unconscious and subconscious mind and bring the unresolved issues into a conscious state. People having their Moon, Jupiter or Sun in conjunction with Rahu or if Rahu in placed in Lagna, in horoscope shall wear it. 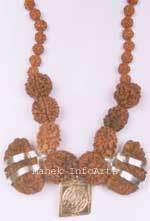 If someone is running through Rahu Mahadasa shall also wear it. Those with Guru Chanda yoga or Kaal Sarp Dosh in their chart shall definately wear it alsong with Rahu yantra silver pendant with silver chain. It shall be worn on Saturday or monday morning. After morning rituals, it should be washed with ganga jal or panchamruit and worshipped and worn in Gold, silver or in red thread, while facing North or east. It can be worn with any other bead. 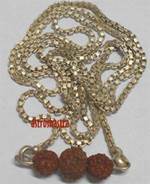 It is very effective if worn with Gomed / Hessonite, Rahu Yantra, Ganesh Yantra, Vashikaran Yantra silver pendant. It should be worn only after being energized by its mantras.